Deeping Swimming Club members in Holland. 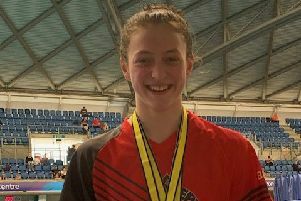 Deepings Swimming Club won 51 medals - 11 of them gold - when taking part in the Netherlands Invitational Meet in Eindhoven. The meeting took place in the Pieter van den Hoogenband swimstadion and attracted teams from Germany, USA, the Netherlands, Belgium and the UK. Gold medal winners were: Katie Rundle (4), Tom Adams (3), Ben Beedell, Bethany Eagle-Brown, Chloe Jones and Joseph Lund. Adams also broke two meet records.